← Italy – A Lost Wine Generation? An amazing NYC wine event for all of my wine lovers and yet ANOTHER reason to sign up for a free newsletter from BlackboardEats.com to get the best deals on food and drink! Should be fun! 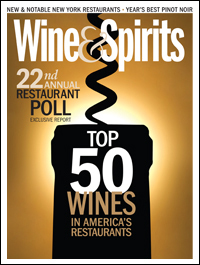 Wine & Spirits Magazine is holding its 3rd Annual Top of the List Tasting on Tuesday, May 10, at the Metropolitan Pavilion in NYC. This top-notch walk-around wine-and-food tasting event features great vino from more than 99 wineries (wineries listed below) and bites from 10 hot restaurants, including ABC Kitchen, Ai Fiori, and Ciano—plus oysters from Grand Central Oyster Bar, cheese from Artisanal, chocolate from La Maison du Chocolat, and lots more. Tickets, normally a bargain at $65 per person, are being offered for to BBE subscribers exclusively for 30% off. And the ticket price even includes a one-year subscription to Wine & Spirits Magazine! But you have to act fast, as the discounted tickets are limited in quantity, and a passcode does not guarantee a ticket or discount!